Single-Payer Health Care in Vermont: What Would It Mean? How Do We Get There? 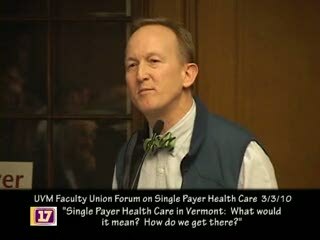 UVM Faculty Union held this forum on Single-Payer Health Care in Vermont. The panel, comprised of, Dr. Andy Coates, Physicians for a National Health Program, Dr. Deb Richter, Vermont for Single Payer, Con Hogan, former Heatlh and Human Services Director, and Judith Cohen, professor of Nursing at UVM.